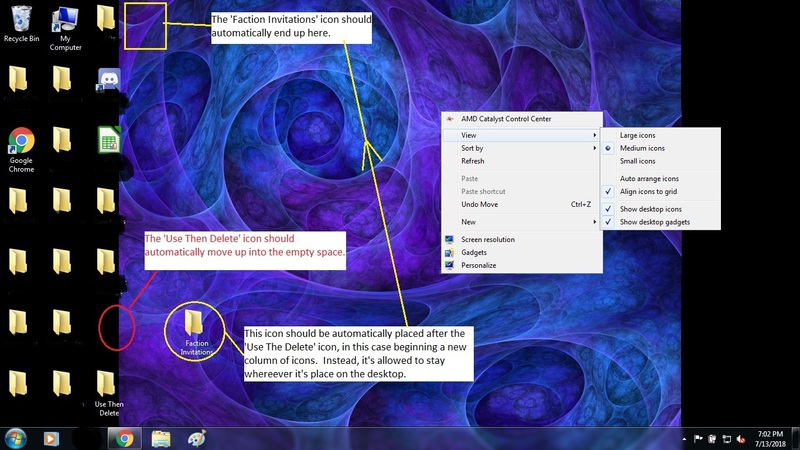 How do I keep my desktop icons together (without empty spaces) in Windows 7? I'm familiar with the 'Align to Grid' feature when right-clicking an empty space on the desktop- that's not what I'm asking for. I want the desktop to not allow empty spaces and 'orphan' icons. When an icon is moved out of the grid, all the icons below it should move up automatically to fill the empty space. New icons should automatically be placed at the end of the column. How can I set that up? This computer, running Windows 7 used to do that by default, but no longer does. How to prevent black boxes on desktop icons in Windows after removing shortcut arrows? How do I have more than one Recycle Bin on my desktop?